Call for services to better tackle the ‘changing culture of violence’ in Irish society. Young men need access to services to help them defuse anger before it reaches boiling point, warns mental health charity CEO. 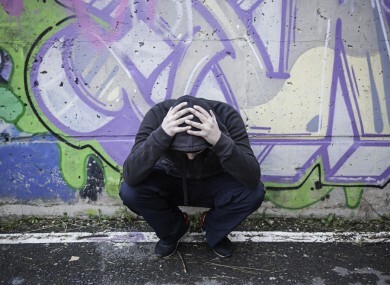 A YOUTH MENTAL health expert has said services are needed to help young men to better articulate their frustrations to defuse their anger before it tips over into violence. Joseph Duffy CEO of Jigsaw, which provides mental health services for teenagers and young adults, said 44% of the young people who present to his colleagues are male. “One of the things we see in terms of the difference between some of the young men and women who present is that the young women are often more articulate in being able to say they feel anxious,” he explained. The issue of ‘anger management’ among Ireland’s young men was raised again last month, after the violent murder of 17-year-old Reece Cullen who was stabbed to death in Jobstown in Dublin. On RTÉ’s Morning Ireland at the time, Archbishop Diarmuid Martin spoke of what he described as “a changing culture of violence going on in the city”. “We have a situation which knives are becoming the preferred weapon in some conflicts and they’re so easy to obtain. You can go to any large store, you can find them in any kitchen,” he said. Duffy said part of Jigsaw’s work is about helping young men to be able to articulate their anger, frustration or anxiety. If they were to end up in a physical altercation, if you track that back – was that the end point or did their temper got the better of them? His organisation is already doing work with the GAA, for example, to raise awareness of mental health services, he said. The Offaly county team even has the slogan ‘Jigsaw’s got your back’ on their jerseys. “That legitimises this youth mental health service, it puts it literally on the backs of the GAA Offaly team. A lot of this is about the message they get from the people who are championing things in their communities that they value. So we talk to the young people themselves but also the coaches, trainers and managers about things to look out for,” he said. In 2012 Jigsaw did a survey of 14,000 young people in Ireland about their mental health and Duffy said they hope to do a follow-up survey this year – with part of that looking at how they can best give young men these messages. Email “Anger management classes could help stem violence among young men”. Feedback on “Anger management classes could help stem violence among young men”.